Curious at how the price of an iPhone 4 from the NZ Apple Online store stacks up? 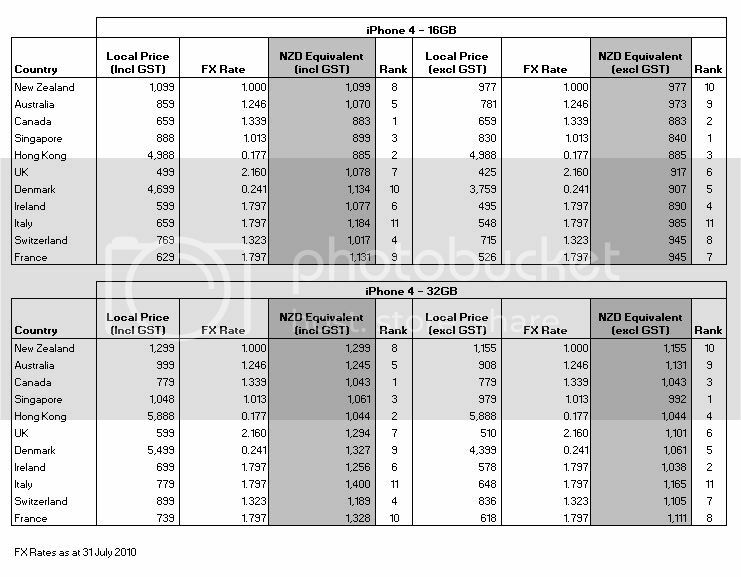 Below is a comparison of prices for all countries where it is currently available to be purchased outright. Thanks - have updated now. Pity I don't have a spare $1043 floating around, I'm in Canada right now argh! Outright purchases are always from Apple, and comes officially unlocked (the only exception I can think of is the US where Apple sells direct but locked to AT&T). gurthang117: Pity I don't have a spare $1043 floating around, I'm in Canada right now argh! Well luckily enough I do and am flying to Vancouver on Wednesday. Just a matter of if they have any stock left! So going by that chart there would be no point me getting one in Aussie when we pass through this weekend? ZollyMonsta: So going by that chart there would be no point me getting one in Aussie when we pass through this weekend? I'd be surprised if they had any stock but if they did you could save yourself 10% with the GST refund program (or whatever it is called). When you leave at the airport you can go to the window and get the reciept verified and have the GST you paid (10% in auzzie) refunded. I think aussie GST is about 10%, so you could knock $100 off purchase price. Thing is about buying in Aussie is that they will not sell to you if you can't pay by credit card. And you aren't covered by the CGA. And good luck finding stock. I am fairly sure the Canadian prices are missing their Harmonized Sales Tax, which is around 15% in most provinces, but it varies, so I think the quoted price is Exc tax. And don't forget that you're trading off your AppleCare Warranty for iPhone as iPhone device is the only device in Apple product range that have limited (geographical specific) warranty.